Platinum Memberships are by application only. Must be upgraded from current membership. Contact the VIP Department for details. The Messina Hof VIP Club was established so that those who love our story and our wines could be a part of something truly unique and exclusive. Our VIP Members are not only part of the Family, but true ambassadors for all that embodies Messina Hof and Texas wine. The signature red beret symbolizes just that - a community of members who feel a strong connection with the Messina Hof founding cornerstones of family, tradition and romance. 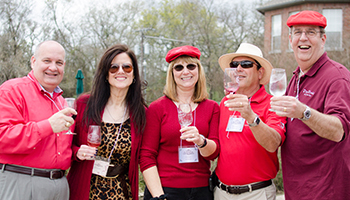 There is always an opportunity to socialize with fellow VIPs at our many Winery events. Messina Hof hosts a variety of annual special events including murder mystery dinners, elegant wine release dinners and celebratory festivals. Along with access to member-only receptions, our VIPs receive discounts on these special events at all 3 locations. As a member of the VIP family, you're invited to exclusive, member-only receptions. These celebrations occur throughout the year at multiple locations, each planned around a unique aspect of winery life. Enjoy wine tastings and light appetizers while you mingle with fellow Messina Hof wine lovers forming life-long friendships with those who share your passion for great Texas wine. Interested in receiving access to even more wine and exclusive events? Ask about joining our Wine Club!